Nepal Telecommunications Authority (NTA), the telecommunication regulator awards a consultancy project KPMG for the development of standards for aerial and underground cables. NTA had shortlisted four candidates for the wire/cable management consultancy project, out of the bidding six companies. Now, NTA selects the M/s KPMG, Haryana, India for the consultancy project. With the consultancy project, KPMG needs to develop standards for laying out aerial/underground cable for Metro backhaul and distribution networks. They also need to develop a pilot project for the wire/cable management. NTA had called a global tender for the consultancy service of managing the wires in city areas. For which, six international firms applied. After a series of shortlist to 4 and then to 2, NTA comes up with the decision and awards the letter of intent to M/s KPMG, Haryana, India. Cost of the cable/wire consultancy project: USD 188,700 (USD One Hundred Eighty-Eight Thousand Seven Hundred only) without local taxes. What the fuss about the cables/wires? Telecom companies and ISP use aerial and underground cables/wires for their backhaul transmission network and distribution of their services. Telecom companies use optical fibers for the transmission connectivity to their base stations and exchanges. They also have the optical fibers, cables, twisted pairs both underground and aerial for the distribution of services to customers premises. Internet service providers also use co-axial cables, optical fibers for the transmission and distribution of internet services. These cables/wires have affected the beauty of the city in a very bad way. Similar cables are also there with electricity distribution for which Nepal Electricity Authority has already started managing/undergrounding in Kathmandu. Experts have an opinion that NEA and NTA should work together for the cable/wire management. Both the entities are government owned and similar tasks need coordination among them. These unmanaged wires/cables are also a threat to several accidents in the city which even resulted in the death of people. 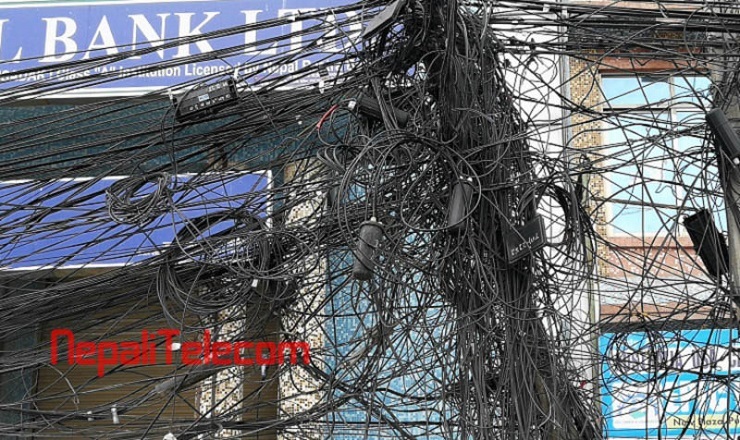 Entangled wires also make telecom companies and ISP difficult to do the maintenance in case of a fault. Read a case for an optical fiber cut. We can expect the firm to provide the service as per NTA requirements within the stipulated time. After which, the pilot project also needs to be successfully completed to result in a wire-free city.